I’m one of those fiddlers who learned by teaching. I’ve played the violin since early childhood, crossing over into fiddling in 1972 with the application of serious elbow grease! After falling like the white rabbit into the world of contradance music, other violinists began asking for help. I soon ran out of answers. Like that rabbit, I’ve been chasing them all my life and I hope I never run out of questions! For technical vetting, I studied in the seventies with great violinists like the late Mary Lou Speaker, principal second violinist for the Boston Symphony. Mary Lou helped me become a better player and she enjoyed the bouncy Québecois rhythms I brought to our lessons. We had a lot of fun and she helped me tame that bounce! Most of what I know about playing efficiently, with good tone and right-hand control, comes from her and from studying and applying Alexander Technique methods. That means I can quickly spot a student’s current learning point and suggest techniques and practice routines to increase skills. I’ve also tried to stand next to the most rhythmically gifted musician in the room for the past 45 years, even if that meant hiring them to play with me! Contradance rhythm masters like Bob McQuillen, Tony Parkes, Russ Barenberg, Molly Mason, Kate Barnes, Stuart Kenney, Selma Kaplan, Max Cohen, Liza Constable and a slew of others inspired me to play the grooves, not just the notes. Fiddlers like Ruth Dornfeld, George Wilson, Gerry Robichaud, Louis Beaudoin, Seamus Connolly, Joe Cormier, Graham Townsend, André Brunet, Pascal Gemme, Alan Jabbour, Allan Block and so many others gave me permission and roadmaps for subdividing and syncopating rhythm. Along the way, I documented what I learned from them – music and variations – in detailed transcriptions so I could remember, analyze, and pass on what I was learning. My Fiddling Demystified for Strings details this method. 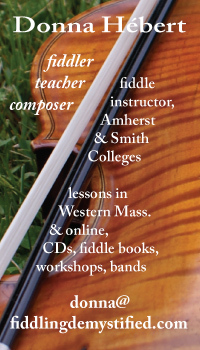 I now teach fiddle and performance students in western Massachusetts at Smith and Amherst Colleges (lessons are also available at Mt. Holyoke through Amherst), and I teach privately and online. Group residencies and workshops are available solo and with guitarist Max Cohen. 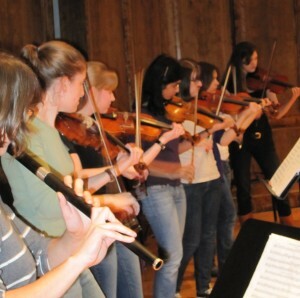 Learn more about fiddling . . .